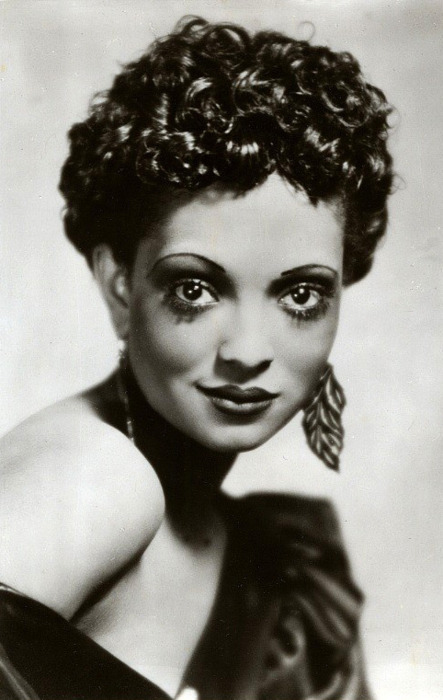 Nina Mae lookin pretty fierce. As made evident by my previous post, pop culture in the 1940’s clearly valued elements of glamour, despite the basic and utilitarian fashions that were popular for real-life working women. Adding to this drama of escapism was the popularity of musical numbers in popular Hollywood films, such as of the above Hazel Scott, a brilliant musician and actress who often made musical cameos in various pictures. Especially for women of color, whose roles were extremely limited by a blatantly racist film industry, the importance of being able to “do it all” was clear: be beautiful, be a gifted actress, sing wonderfully, play an instrument. Often, women of color fell into two categories when it came to Hollywood casting: the well-meaning, unintelligent but caring “maid” or “nanny” character, or, on the opposite end of the spectrum, the extremely beautiful and unattainable glamour girl, often cast in the role of a musician or so-called diamond in the rough who was too good for her current surroundings and situation, which sometimes included the cringe-worthy but relevant plot-line of “passing” for white. Despite these typecastings, women of color in the entertainment industry still delivered iconic performances, and I’ve collected some of what I find to be the key elements of style for the songstress/chanteuse archetype from throughout the 20’s, 30’s, and 40’s.